Heart attack, acid reflux, collapsed lungs, etc. – there are many possible causes of chest pain. Every one of us, at a certain point, experiences or will experience chest pain. Although chest pain may exist just for a couple of minutes and then disappear, it could, however, be dangerous and a serious detriment to our health. There are several causes why chest pain exists, and it is important for us to distinguish between each of the causes so as to avoid any chest pain issues. Heart attacks are a common cause of chest pain and usually experienced by those in middle-age. They are caused by a reduction in blood flow through the heart blood vessels, causing the cells of the heart muscle to die. Although heart attacks are sometimes similar to another cause of chest pain, angina, heart attacks are usually more severe and cannot be relieved by rest. There are certain risk factors one should avoid to prevent heart attacks, such as: high cholesterol, smoking, diabetes, high blood pressure, obesity, usage of dangerous drugs, etc. Angina is a possible reason for having chest pain. Another severe cause of chest pain is Angina or Pectoris Angina. 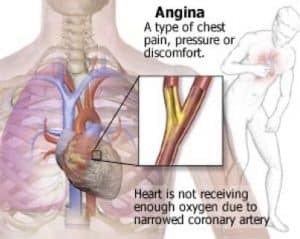 Angina is severe pain experienced in the chest area and caused by the blockage of the heart blood vessels which reduces the oxygen and blood flow to the heart. It may not cause permanent damage to the heart, it may, however, spread a pressure or squeezing sensation of pain to your arm, shoulder, jaw or back. It can be triggered by emotional stress, heart disorders or too much physical exertion. Unlike a heart attack, Angina can be relieved by rest. Esophagus related causes of chest pain usually originate from esophageal spasm, acid reflux or GERD, or esophagitis. All three of these are caused by different factors, but result in the same severe discomfort to our body which is chest pain. The esophageal spasm is caused by uncoordinated and excessive contractions of the smooth muscle of the esophagus. This spasm usually takes place when you are swallowing a very hot or very cold fluid or suffering emotional upset. Esophagitis, is when the body acquires fungi, virus, bacteria, yeast or irritation from medication, creating complications for the body and the feeling of chest pain. The final cause of severe chest pain is acid reflux (commonly known as GERD), and can originate from various factors. Factors that may decrease the pressure on the lower part of the esophagus, prolong the emptying of the stomach or reduce movement of the esophagus. These factors include: excessive intake of caffeine, nicotine and alcohol, over consumption of high-fat foods, and diabetes or scleroderma. Spontaneous Pneumothorax, or collapsed lung, takes place when the collection of gas and air in the space between the chest and the lungs collapses, preventing it from inflating completely. It usually occurs when the sac that contains the lung and the outside atmosphere loses its pressure balance and gets disrupted. There are several causes of a collapsed lung, usually resulting from injury or trauma to the chest, including: a bad fall, gunshot wound, stabbing, car crash or even during surgery. Also, there are risk factors one should consider for pneumothorax, such as emphysema, severe asthma, cancer, aids-related pneumonia and prohibited drug use. A perforated viscus can be experienced for a number of reasons, including: trauma to the abdomen, infection or disease, ulcers or ruptured cysts, or even abdominal obstruction. Symptoms range from the fairly mild to the more severe, and include: chest pain, abdominal pain and stiffness, fever and nausea. 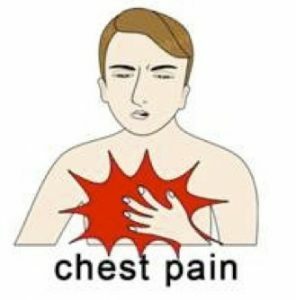 Chest pain on the right side – the reasons of right side chest pain might completely differ from the causes of pain on the left part of the chest. Heart pain after eating – read more about the most serious reason why your chest might hurt.